Fear not, we’ve pulled together some of the hot topics and top trends covered at the event for your infographic pleasure. 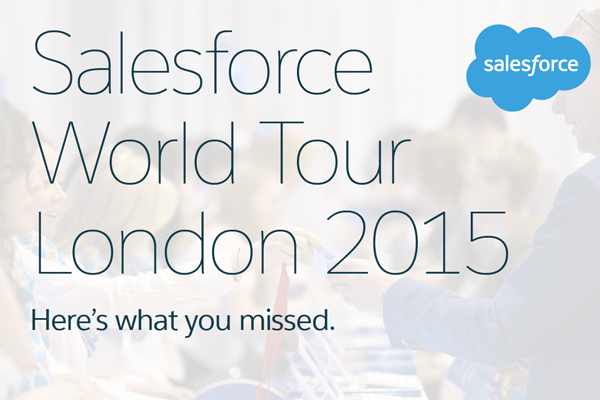 We crunched the content and analysed the presentations to bring you a selection of highlights from this year’s event. If you were there on the day, the “Overheards” might ring a bell. These were some of the juiciest nuggets from keynotes, demos and general chatter on the expo floor. The infographic below is also a visual distillation of the wider trends driven by cloud adoption. We look at how we got where we are today, as explained by Salesforce Vice President and Chairman Keith Block during the main keynote presentation. The old days of the mainframe and server-based infrastructure have given way to today’s cloudy world. A world with the customer at its heart, where success isn’t measured in sales alone but in meaningful engagement throughout the customer journey. A world we hope you recognise.